ZOOMA made the Top 20 AGAIN! 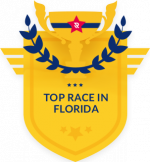 Zooma Florida was voted one of the top 20 half marathons AND top 20 for beautiful, on-course scenery! Check it out at The Bib Rave 100. Seaside Challenge. If you’re looking for a Challenge that only Amelia Island can offer, run the 5K on Saturday evening and the Half or 12K on Sunday to complete the Seaside Challenge and receive the Seaside Challenge medal! Sign up for our e-newsletter to get the most up-to-date info on 2019 ZOOMA! Check out our 2018 Finisher Medals – the 2019 new medals will be revealed soon! Imagine a powerful sea of women on the move – encouraging fellow runners, creating unforgettable moments, getting strong, and celebrating personal running triumphs in beautiful locations. Imagine a post-race party where you’ll celebrate your run with your crew, relax and be pampered with massages, yoga, and mimosas. This is ZOOMA. Bring your best friends, your sister, your mom or your daughter for a weekend you’ll remember for years to come! Voted as one of the Top 20 Half Marathons by BibRave 100 and recognized as one of The Top 10 Women’s Races by Shape Magazine, ZOOMA Amelia Island Half Marathon is a race weekend you simply don’t want to miss! FRIDAY NIGHT FUN. Pick up your race packet and shop, hang out and have fun with your crew. Plus we’ll be hosting a Welcome Party – more details coming soon! RUN. Join us Saturday evening for the Lighthouse Loop 5K or Sunday morning for the Half Marathon, 12K or 5K through lovely Amelia Island and Ft Clinch. See for yourself why runners love ZOOMA! Expect gorgeous ocean views and a shady tree lined run through Ft Clinch as you complete these one-of-a-kind courses! SUNRISE YOGA SATURDAY. Stretch out before race morning with yoga overlooking the beaches of Amelia Island. Challengers will also receive a Wine Country Challenge medal! Complete the Lighthouse Loop 5K + Half Marathon or 12K to earn the Seaside Challenge medal! Virtual race participants may complete the race at any time during the month of March and no documentation of completion is required (but we’d love to see a pic of you once you finish!). Virtual packet will be mailed to you the week AFTER the race and will include race shirt, cinch sack and finisher medal. Both women and men and runners and walkers are welcome and encouraged to participate in all ZOOMA Women’s Race Series events. Participants must be at least 12 years old to register for the half marathon and able to complete the course in 3.5 hours. Registration fees are non-refundable and non-transferable. If you’re a member of Fellow Flowers, make sure to check the Fellow Flowers check box during registration. If you’re participating as part of Black Girls Run!, make sure to check the check box during registration. We are offering a variety of resorts at a great ZOOMA discount in Amelia Island. Please note that you’ll be responsible for your transportation to/from race day. See Travel Details and Amelia Island Accommodations here. Additional accommodations will be added as they become available. ZOOMA Women’s Race Series and The DONNA Foundation will race together again to finish breast cancer at ZOOMA Florida! The DONNA Foundation is a non-profit organization dedicated to providing financial assistance and support to individuals living with breast cancer and funding ground breaking breast cancer research. To date, The DONNA Foundation has served more than 10,000 families by providing over $5 million dollars in economic assistance and emotional support to individuals living with breast cancer. Additionally, they have helped develop and maintain the Mayo Clinic Breast Cancer Translational Genomics Program. Can’t attend the race but want to support The Donna Foundation? You can always run with us virtually! You’ll love the new ZOOMA Florida Half Marathon course. Run through the quaint city and neighborhoods of Fernandina Beach and Old Town. The final portion of your run takes you through the tree lined roads of beautiful Fort Clinch with an oceanview finish at Main Beach. Run the new ZOOMA Florida 12K course and start and finish with the scenic oceanviews at Main Beach. You’ll run past Amelia Island marshes and quaint neighborhoods. The final portion of your run takes you through the tree lined roads of beautiful Fort Clinch with an oceanview finish at Main Beach. The Finish Line of the Half Marathon, 12K + 5K leads into an unbelievable oceanfront Post-Race Party at Main Beach featuring mimosas, food, massage, recovery yoga, shopping, live music and tons of fun! You’re going to LOVE the new Lighthouse Loop 5K course (Saturday night)! Join us on Saturday at 5pm for a family friendly 5K loop with lovely views of Amelia Island and the highlight of the course will be the Amelia Island Lighthouse – the oldest lighthouse in Florida. The 5K will start at finish at Main Beach. Pacers will be on the half marathon course. Please see the final race instructions for additional details. There is a 3.5 hour course limit to complete the half marathon. There is no race day packet pick up for the Half Marathon or 12K unless you purchase the Race Day Packet Pick up. Please pick up your packet on Friday or Saturday or purchase the Race Day Packet Pick up option. We suggest that you bring your registration confirmation email with you to packet pick up, however, your confirmation email is not required. We do allow you to pick up a race packet for someone else. Shirt exchange will be available at Packet Pick Up and the Information Tent on race day. Exchanges will be based on availability only, are not guaranteed and are on a first come, first served basis. If you purchased a virtual race packet, please note that this will arrive one week AFTER the race weekend. Aid stations will be located approximately every 1.5 to 2 miles along the race course with 7 aid stations in total. Stations will include water, portable toilet and minor first aid supplies. Nuun Hydration product will be available at select locations. GU Energy Gels will be available on the Half Marathon course only. Participants will have access to bag check at the start of the race. Please see the final race instructions for additional details. The awards ceremony will take place at the Post-Race Party. Awards will be presented to the top 3 overall female race winners and top 3 Masters females for the Half Marathon, 10K and 5K. Age group awards will be given for top 3 female finishers in each age group. Awards will not be mailed following the race so please attend the awards ceremony to pick up your award. To register for the Kids Races, go to the Information Booth on race day. Registration is free but we do ask that you fill out a waiver and registration from. Races will be held rain or shine, however, if there is severe weather in the area the race start may be delayed or cancelled. As a reminder, registration fees are non-refundable and non-transferable. In order to ensure safety of all runners, bicycles, roller skates, in-line skates, baby carriers and dogs are prohibited from the race course. Parts of the course are open to vehicular traffic throughout the run. It is VERY important for you to stay alert throughout the race, stay inside cones and obey all race and traffic signage. Jogging strollers are permitted but must start in the back. We are recruiting a team of dedicated volunteers to assist with the ZOOMA Florida race weekend! Are you part of a charitable organization? We have volunteer fundraising opportunities for groups such as schools, clubs, churches, and other not-for-profit organizations. Please contact us for more information on the volunteer program. Visit the FAQ page for more race details. Imagine a powerful sea of women on the move – encouraging fellow runners, creating unforgettable moments, getting strong, and celebrating personal running triumphs. Picture an inspiring weekend filled with strong women, yoga sessions, speakers, an exciting expo, and celebrations in an unforgettable resort location. This is ZOOMA. Women First. ZOOMA races are created for women by women. We are a very small team of female event planners and athletes who are passionate about delivering top notch races for women like you. Runner amenities and swag are designed exclusively with women in mind and weekend activities and events are planned to appeal to you, the female athlete. Community of Support. We believe it’s incredibly important to support each other’s goals, dreams and aspirations. The ZOOMA community is made up of like-minded women who seek to achieve athletic and personal goals and support each other while doing so. ZOOMA race weekends are always filled with fun and incredible support. 2017 Zooma Florida Album courtesy of Phil Smith, one of our Zooma fans!